Thrips are the most consistent insect pest of cotton in Georgia and the southeast. Near 100 percent of the cotton planted in Georgia will be infested by thrips each year. Preventive insecticides applied as a seed treatment and/or infurrow application at planting for thrips control provide consistent yield responses. In some situations supplemental foliar insecticides may be needed in addition to preventive treatments at planting. High risk planting dates will require more aggressive thrips management compared with low risk planting dates to achieve acceptable thrips control. Management options for high risk planting dates would include the use of infurrow liquid insecticides such as acephate, imidacloprid, or aldicarb or the use of a neonicotinoid seed treatment plus a supplemental foliar application at the 1-leaf stage. In low thrips risk environments neonicotinoid seed treatments will generally provide acceptable control. The TIP tool should allow proactive decisions to be made relative to thrips managment. How confident should I be using this TIP tool? My thoughts are exactly as those of my colleague at NC State who answered this question very well. Any forecast will have some uncertianty. However, this tool is based on many years of data from across the Southeast US Cotton Belt and has been validated several years since. We are very confident that this tool, when used as instructed, will accurately forecast thrips risk in cotton. 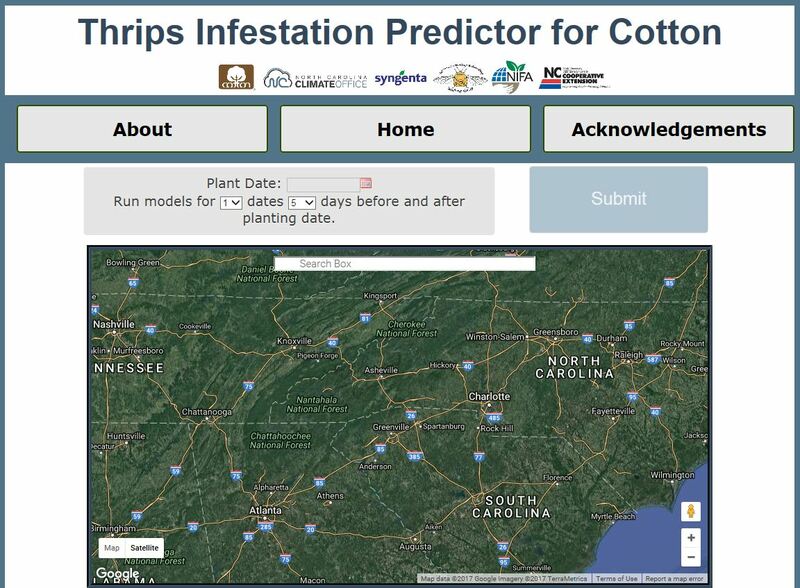 The TIP tool will not replace scouting and sampling for thrips and thrips injury in cotton. But it does provide information which will improve our thrips management programs.